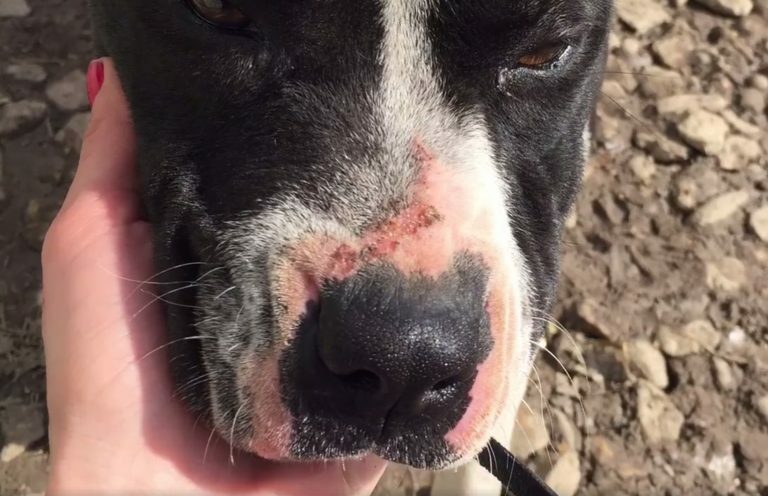 When animal rescue group Dallas DogRRR heard about a pit bull that had been dumped on the side of a busy road, they knew they had to rescue her. The dog had taken refuge in a junkyard, and a kind man who worked there looked after her. The dog—who the rescuers named Pittie—was very sweet, and she loved getting pats on her head. When Dallas DogRRR arrived at the junkyard, they learned that Pittie wasn’t alone. She was looking after a tiny two-day-old kitten. 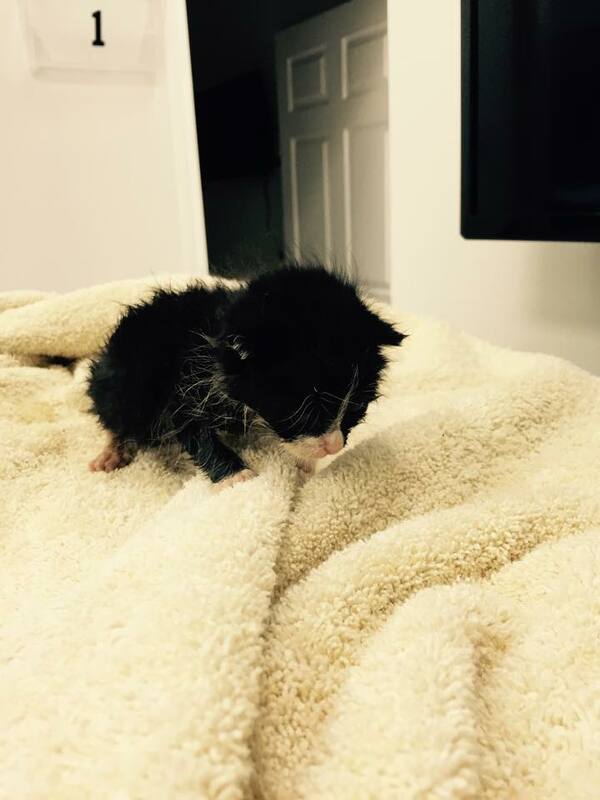 The man who worked at the junkyard led the rescuers to the kitten, Pittie following close behind. 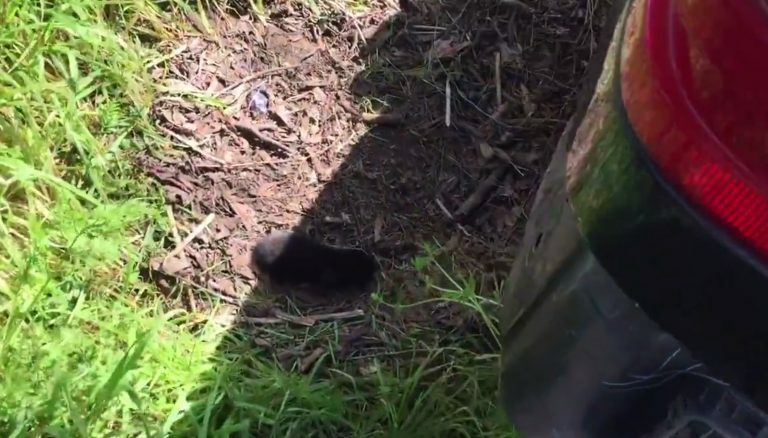 When the rescuers reached the kitten, it wasn’t moving, and the rescuers started fearing the worst. But then, the kitten started crying, and everyone breathed a sigh of relief. It was clear from Pittie’s appearance that she had just had puppies, but sadly, it seemed they had been taken away from her. Pittie seemed to have adopted Kitty, who was abandoned by her mother. She licked the kitten to keep her clean, and she nursed her. Dallas DogRRR brought the pair over to Mercy Animal Clinic, where they were cared for by a veterinarian named Dr. Hamlin. The vet was shocked to see how bonded the pair were—in his 28-year career, he’d never seen anything like it. It turned out, the pair was extremely lucky. Pittie’s milk ran out soon after she was rescued—if the rescuers had waited any longer, she wouldn’t have been able to nurse Kitty anymore. Pittie was in good health, but Kitty needed more care. 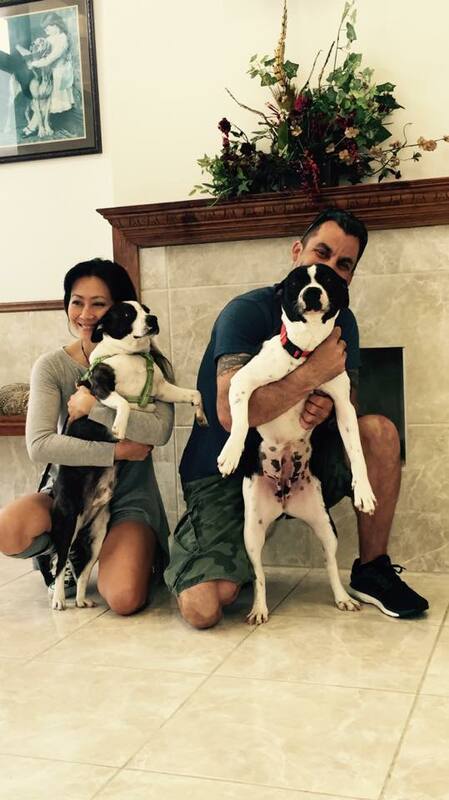 Dallas DogRRR was able to find a good foster home for Pittie, and so for the first time, the pair was separated. 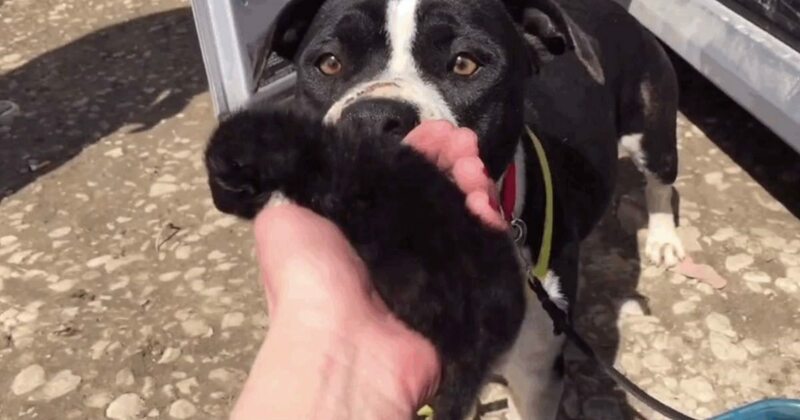 When Kitty was out of sight, Pittie started howling—she already missed her baby. 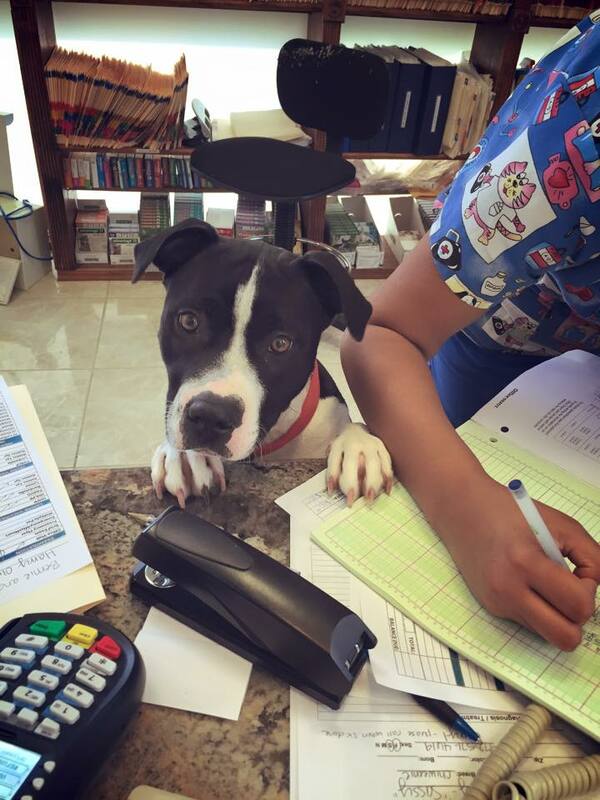 The next morning, Pittie’s foster parents brought her over to the clinic. 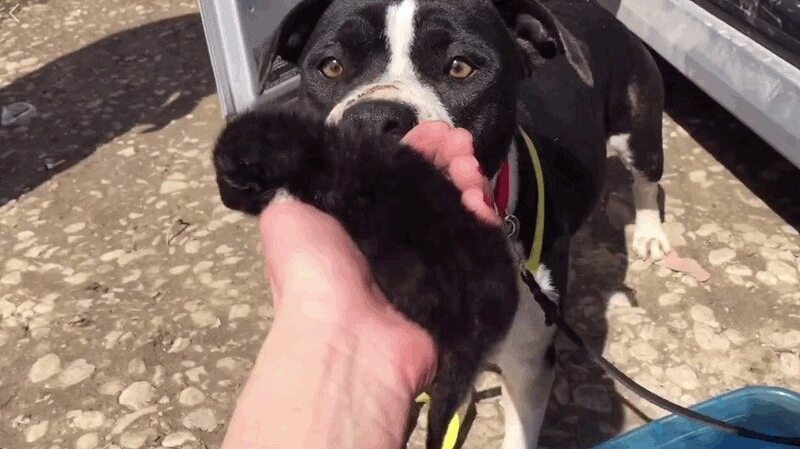 Pittie was so happy to see Kitty. She started cleaning her right away, and she refused to leave the kitten’s side. Pittie performs the morning cleanup. Since they were so bonded, Dallas DogRRR planned to adopt Kitty and Pittie out together. But unfortunately, Kitty suffered malformations in her kidney and bladder, and she passed away about a week after arriving at the clinic. Even though Kitty sadly didn’t live long, her weeks on Earth were filled with love thanks to her sweet, caring pit bull mom. Soon after this, Pittie found her forever home. While Pittie was clearly still sad about Kitty, she did adjust to her new home. Her new parents had another dog, and Pittie quickly bonded with him. After all she had been through, Pittie deserved a wonderful forever home, and thankfully, she found one. If you’d like to learn more about Pittie and Kitty’s rescue, check out the video below.